The artwork of Julie Pratt, a senior painting major in the College of Visual and Performing Arts’ School of Art, is being presented during the month of September at the Art Gallery at May Memorial Unitarian Universalist Society, 3800 E. Genesee St., Syracuse. The exhibition will close on Tuesday, Sept. 29, with a meet-the-artist reception from 5-7 p.m.
Pratt’s larger-than-life artwork focuses on themes of gender identity, unconventional beauty and personal power. Through a combination of intense color, expressive brushwork and inspiring subjects, she describes a search found within all of us to be confidently who we are. “It’s all about the process,” says Pratt. “From initial inspiration, through the preparation of the canvas, to the final strokes of paint, each step is combined with the last to create something beautiful. I take an expressionistic approach to painting, seeing each subject as an emotional object to be described to the viewer. Pratt is from Central New York and is also an arts educator, currently teaching youth classes at the Everson Museum of Art. The exhibition is curated by Kristina Starowitz ’03 in partnership with the University and May Memorial Unitarian Universalist Society. 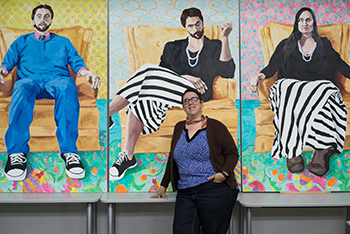 Starowitz curated the Westcott Art Gallery from 2007-13 as well as the Gallery at the Tech Garden in 2014 as curator and artist in residence. Pratt’s exhibition will travel to Syracuse Stage in January to be exhibited in the Sutton Pavilion gallery space for the run of the show “Stupid F***ing Bird” Jan. 20-Feb. 7. Gallery hours at May Memorial are Monday-Friday, 9:30 a.m.-2:30 p.m. Call 315-446-8920 in advance to visit the gallery outside of announced special events, as the space is often rented for private gatherings. For more information about the exhibition, contact Starowitz at 315-214-6444 or kgstarow@syr.edu.